I’ve been collecting and documenting ‘volunteer’ plants, as my mother calls them (most people would use the term weeds) from along streets and walkways since 2011. I select an area that is approximately 5 metres square and pull up the plants, roots and all, from that vicinity. I then record the location and the date of collection, with these details becoming part of the title for the work of art. Caroline Rothwell’s description of her process of plant collecting has much in common with the garden-variety botanist: careful removal of the sample, citation of the date and location, and even the mounting and labeling of the specimens. Rothwell’s collecting however, is neither underpinned by research (at least not of the botanical kind) nor by the desire for cultivation. Through each act of collection and collation, she is creating a new class of plant – a überplant. She’s playing God… or at least Goethe. Goethe’s theories seem fateful premonitions of modern-day investigations into hybridity, bio-mimicry and genetic technology. This new, über science with its malevolent and utopian potential, combined with Goethe’s more than 200 year old theories, have informed Rothwell’s Urpflanze street plant series, exhibited here in the auspicious context of the Santos Museum of Economic Botany. 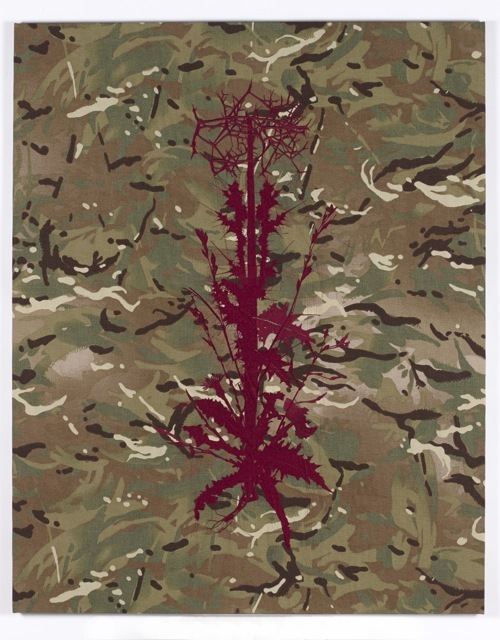 Some of the über plants are ‘drawn’ in embroidery onto camouflage backgrounds, with each camouflage pattern providing the geo-political context for the place of collection. For example, Ben Quilty collected and documented weeds whilst in Tarin Kot, Afghanistan in 2011 as Australia’s official war artist. Using 171,700 stitches the weeds collected by Quilty are recreated onto the Multi Terrain Pattern (MTP) worn by Australian soldiers at war in the region. Military camouflage imitates the local environmental – taking its cues in both colour and shape from the endemic botany. Put more simply by the artist herself, “I see plants as paralleling how humanity travels. Where we go they follow. Like us, they are exceptional colonisers”.